OMEGA's DMD4008 accepts a resistance input from potentiometer, slidewire, linear position, displacement, or rotational devices and provides an optically isolated DC voltage or current output that is linearly related to the potentiometer position. It will accept any potentiometer with a value of 0 to 100 ohms through 0 to 1 Megohms without recalibration and without affecting accuracy. 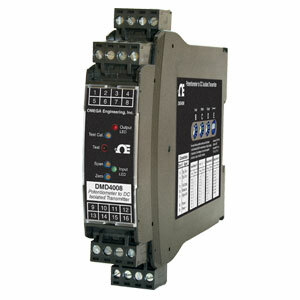 The DMD4008 output can be field configured via external rotary and slide switches, Offsets and/or input ranges other than 0 to 100% of the potentiometer range can also be selected. Output Zero and Span: Multi-turn potentiometers to compensate for load and lead variations, ±15% of span adjustment range typical.